With a very pronounced and distinct awakened global community observing both domestic and world events unfold in real-time, we are now able to record amazing clear observations about all the propaganda and deceptive techniques being used to enslave humanity. We are now being showered with concrete examples of propaganda, lies and deceit in a way that could make some laugh, while making others cringe in more solemn disbelief. Now is the time to tone down your emotions and observe. Take in the knowledge and believe that there is a purpose for all of this. Don't forget the rules. The clearer the agenda in play the greater the resistance will be. Anyone paying attention to the propaganda being put out by western mainstream as they continue to squeeze every ounce out of the most recent false flag shooting in San Bernardino to use for their own gun grab agenda, should be in awe at how hard the establishment is trying. In the most over-the-top state sponsored gun grab propaganda article yet put out by mainstream media titled “The man who bought the rifles” the New York Times puts out irrelevant details about “Enrique Marquez” in an attempt to accomplish multiple agendas. 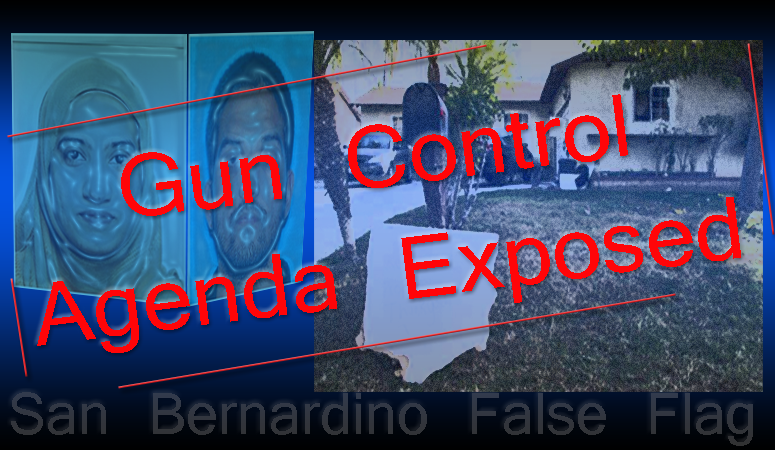 The main agenda being to tell us how he went about obtaining the rifles supposedly used in the shootings in San Bernardino. The article specifically focuses on the process of actually obtaining the guns as if America should care that the process itself is to blame for the false flag shooting. The propaganda article, which as usual is conveniently written by a team of writers in order to protect the writers, assumes from the start that NOT having a gun would somehow prevent mass shootings. The supposed team of writers which include “Jack Dolan, Zahira Torres and Paloma Esquivel “ carefully paint the gun purchasing process itself as the incriminating act which would have prevented the event. Be not fooled. This “purchase” is what the western cabal's team of New York Times writers want you to focus on because they need you to give up your guns now so that only government will have guns and all of humanity can be crushed under their tyrannical force. Anyone still suffering from intellectual autism and focusing on the gun purchasing process is completely asleep in the matrix of lies. This is propaganda from the same government that has been caught arming proxy armies, terrorists and drug lords. Gun control is an agenda against freedom and nothing else. Conclusion? People with really nice smiles who pray and happen to be Muslim or Hispanic and like to work out and contemplate joining the Military could be dangerous terrorist supporters. Therefore they should not be allowed to buy guns. It should be noted that not only is the article source hidden behind many layers such as multiple writers and “federal officials” speaking on condition of “anonymity because the probe is ongoing”, but most of details are given by one woman 'Vivian Ramirez' a “friend of Marquez’s and fellow student at Riverside Community College” who bonded because they both wanted to join the military. Interestingly Ramirez's exclusive views are presented as the final word in what was happening in Marquez's life. A notion that could very easily be false. Ultimately it doesn't matter much. Ramirez's account could be accurate or not. The real trick here is it gives authenticity to the topic. The comments she makes about Marquez actually just serve to fill in the article with aimless details. In the end, the goal of propaganda is to engage your mind mostly in the headline. Despite Marquez’s links to the terror suspects, Ramirez said she doubts he would have done anything to help Farook and Malik if he knew what they had intended to do with the weapons. This conclusion should remind us that when it comes to propaganda, it's about the headline. Anyone falling for this gun grab propaganda would tune out the fact that we're talking about what sounds like an otherwise average nice guy who has likely done no wrong. Once again, the lure of the propaganda message here is first that nice guys can be secret terrorist supporters and that terrorist supporters can be disguised as nice guys. Second, it also sells the idea that since unassuming nice guys could be terrorist supporters they should all be banned from buying guns. Finally, we're being sold on the ongoing idea that somehow banning guns or making it difficult to get a gun or rifle will somehow decrease mass shootings. All of this is modern times super propaganda being pushed by the ruling elite who are attempting to destroy America, disarm Americans and establish their global government. Anyone still blind to this clear agenda is a danger to themselves, to freedom and to America as a whole, even if they mean well. The irony of all the latest and usual western media gun control propaganda is that the truth is exactly opposite of the propaganda being sold here. The only way to secure a prospects of a free state is if the people are armed and the bigger the weapons the better. Even if that means dealing with a mass shooting every single day of the year. Of course statistics prove that where people are armed there are no shootings whatsoever and if all Americans were armed that would almost certainly end all mass shootings. The time is now to realize that the police state is a fraud. They never have kept America safe and they never will. Resist the gun control tyrannical agenda based on ongoing false flag crisis actor shootings and annoying political rhetoric against guns that always follows these events. Remind yourself that as a species we are of far superior intellect than the monkeys who write these articles and the politicians who artificially push for gun control as if tyranny is preferable to freedom and as if disarming the public will solve our problems.